We have a stellar line up of speakers this year. 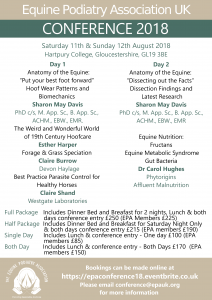 We have been lucky enough to secure Australian Equine Anatomy research professor Sharon May-Davis as our keynote speaker. Sharon will be talking about what we can learn from hoof wear patterns and about her latest dissection findings. We also have Dr Carol Micheals talking about gut health and fructans, as well as Westgate Labs and Devon Haylage talking about worms and grass speciation. Esther Harper will be talking to us about the weird and wonderful world of shoeing in the 19th century. We have packages from Day only to a fully catered weekend with en-suite accommodation. CPD certificates are available for those who need them. Contact conference@nullepauk.org for more details.